Lovingly crafted by us, lovingly gifted by you. This beautiful heart shaped red wax truckle filled with the finest vintage Cheddar will put a smile on any cheese lovers’ face this Valentine’s Day. This delicious vintage cheddar is crafted in the heart of Somerset with love. Matured for over 15 months for a smooth, yet silky texture, with a slight crunch, always the sign of a well-aged Cheddar. A rounded flavour, balancing sweet notes, with creaminess and nuttiness thrown in for good measure, its complexity should build in your mouth like a fine wine. Perfect enjoyed on its own or on a cheeseboard with some delicious extras. Remember, opposites attract so you can get creative here! 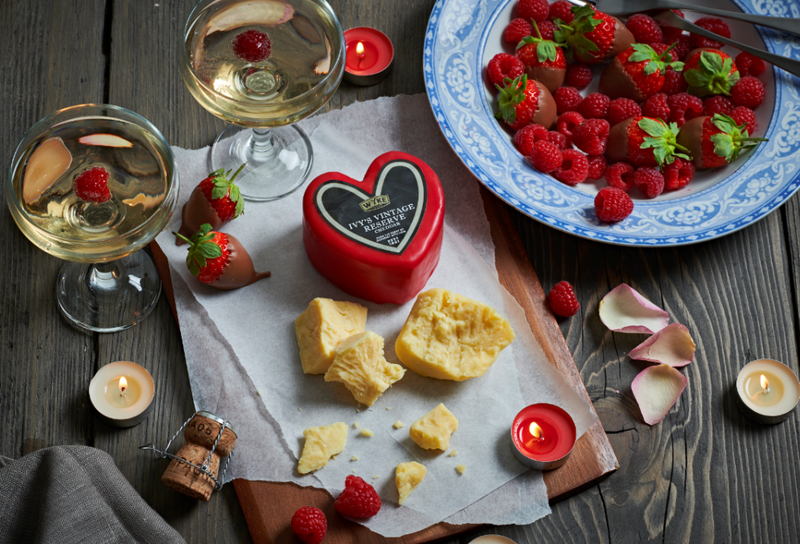 Not sure where to start with your cheeseboard this Valentine’s Day? Don’t worry, we have some quick ideas that require very little prep but still have a wow factor! Why not try these classic ingredients to help mark the day in style? Olives make a great partner for cheese and lots of them. Just dot them artfully around the board, simple and the perfect complement to our cheese! What do you put on your cheeseboard? Tweet us your images @wykefarms.